Guys - you make great 'connections' for customers - am impressed by your service and delivery. More and more new release Blu Rays and Games are featuring cinema-quality sound with seven channels of discreet audio - plus subwoofer enhancements - to really put you in the middle of the action. 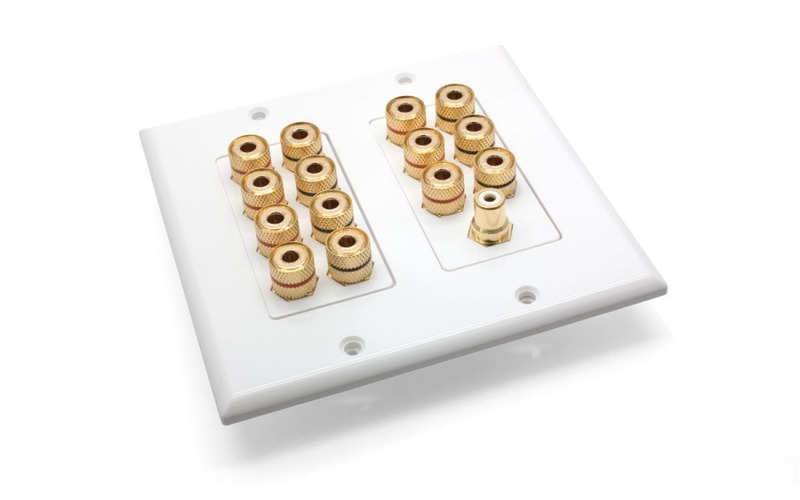 What you don't want, however, is a cluster of piecemeal wall plates hogging wall space behind your home theatre - you want one hub to rule all 15 plugs at once! In steps this double-gang wall plate. With a waft of smoke, a dramatic slow-motion sequence and no less than two fainting damsels, it shows off seven pairs of red and black binding post style speaker terminals (great for bare wire and banana plugs) plus an RCA socket for running a subwoofer! Treat yourself to an immaculate, permanent installation during your next renovation or when building your new house. There's nothing quite like augmenting your house to deliver the best entertainment possible! It's compatible with any 5.1, 6.1 or 7.1 Speaker System, and can even work as an option for two-zone audio! NOTE: This wall plate requires a double-gang bracket which is not included. Just wondering if can swap the 4 x subwoofer connectors for 2 x red and 2 x black connectors for zone 2 (alfresco) instead? Answer: "Yes this would be pssible on this plate. When ordering, please add in your order comments a message like "Please replacement 4x Subwoofer connectors with 2x Red and 2x Black Speaker Binding Posts." Please note that the wall plate will still have 'Subwoofer' printed on it however." Answer: "The product measures 164 mm x 114 mm. Unfortunately we currently don't currently stock triple gang C clips." Answer: "You have the option of either bare wire or banana plugs on both sides of the wall plate (excluding the RCA connections). Generally it is better to use tidy bare-wire connections inside the wall, and banana plugs outside for easy plugging and unplugging." Thank you. I am very satisfied with your service.